Until May 31, 2014 at the Museum of the Land of Israel will be the new small exhibition titled "To the source", dedicated to the visual image of a woman with a pitcher. Since ancient times, women bring a jug of water, was the personification of the healing power of nature and all living things. 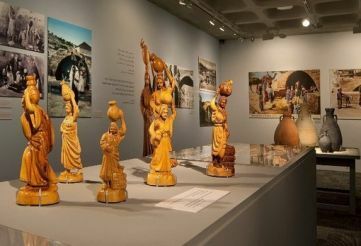 The exhibition will be presented in Israel poselenok photos first in the Arab and Bedouin costumes at the source of the Virgin Mary in Nazareth and other sources of the Promised Land. Besides, here you will see the private collection of clay, bronze and other pitchers and water vessels as simple shapes and the most unusual.